Oysters served raw with a mignonette are one of life’s little luxuries. They are so good, in fact, that it is easy to forget that there are other ways to enjoy oysters. While it is very easy to overcook the bivalves a quick trip to the grill is an excellent option (and obviates the need for all that annoying shucking). 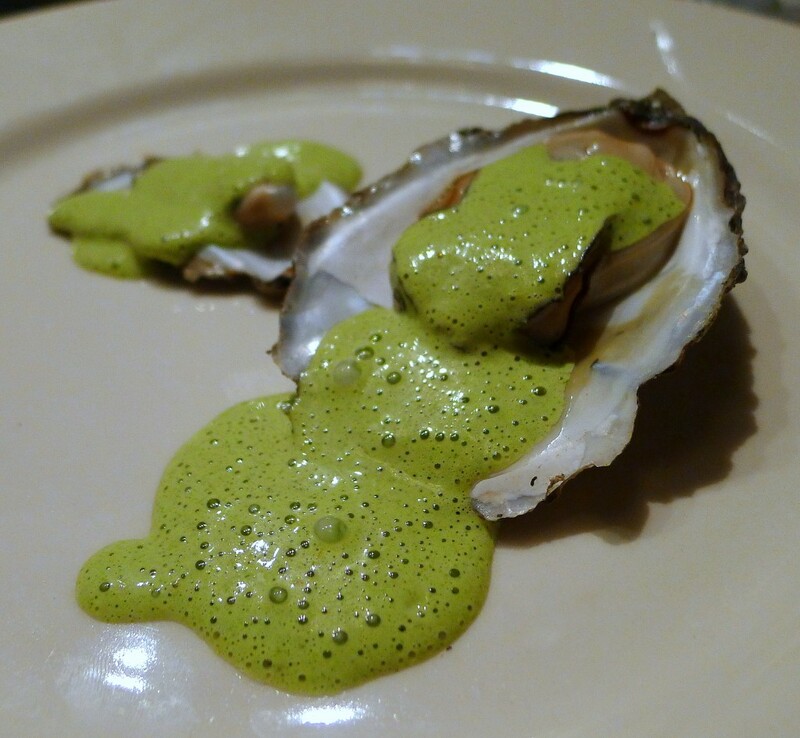 The sauce for our grilled oysters is a revision of the Chimichurri Bearnaise that Brian Malarkey uses for his Culotte Steak at Searsucker. http://www.dacor.com/The-Dacor-Kitchen/Recipes/Chef-Brian-Malarkey/Culotte-Steak-Plus-Fried-Onions-Plus-Chimichurri-Bearnaise.aspx. My view of that dish is that it was less than successful because it was trying to be two classic sauces for steak at once and ended up being neither. What really did not work (for me) in the sauce was the parsley (and, to a lesser extent, the garlic), both of which seemed to fight with the tarragon. Tarragon is an herb that – like an unruly kindergartner — does not play nicely in the sandbox with others. So, what I did was strip some of the chimichurri elements from the sauce, and bring it back to what did work in Malarkey’s recipe: the texture from the herb and the addition of the vinegar. Start the grill. Light the charcoal grill and allow half an hour to 45 minute for it to reach temperature. Meanshile, scrub and rinse the oysters. Begin making the sauce. Place the eggs, lemon juice, and Tabasco in a Vitamix or other high speed blender and process on medium-low speed until well combined. In a saucepan on the stove, melt the butter over very low heat. There is no need to clarify the butter because the solids will help achieve the desired texture in the sauce. Finish the sauce. Just before you put the oysters on the grill, add the butter ito the blender in a slow, steady stream with the blender on medium until completely incorporated. Add the remaining ingredients, processing on medium-high speed, until well combined and until the sauce is frothy and smooth. Cook the oysters. 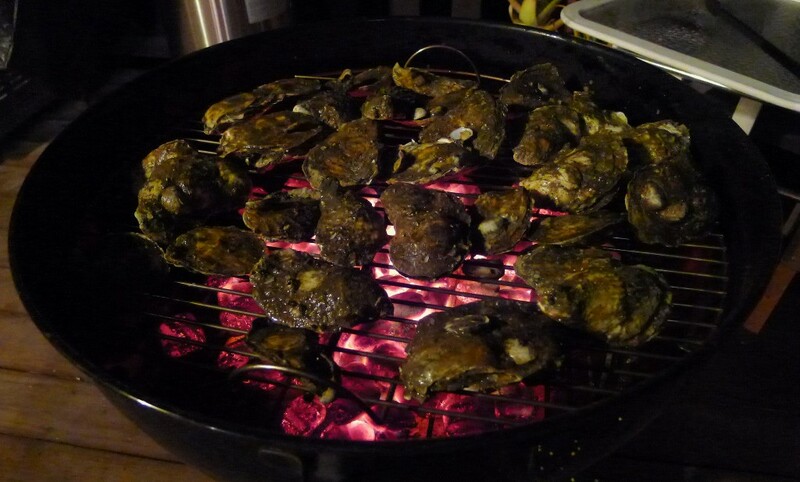 When the coals are hot, place the oysters flat side up directly on the grill. Cover the barbecue with the lid (but with vents open). The oysters are done when the shells open. Using a mitt remove the oysters from the grill by hand (tongs are acceptable, of course, but you run the risk of losing the delicious liquor). Plate the dish. 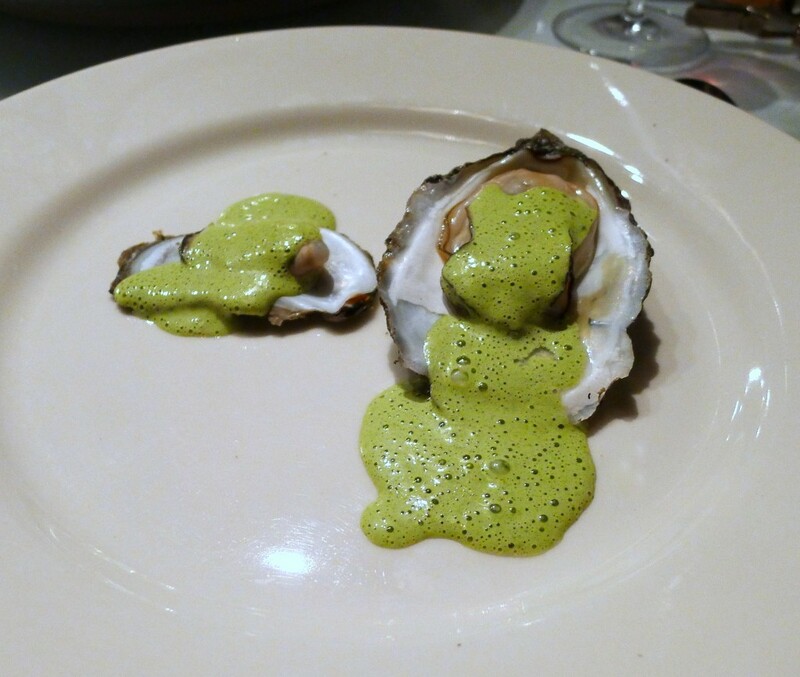 Either serve the oysters on a platter covered with rock salt and pass the sauce in separate boat or serve two to three oysters per plate with the sauce drizzled over them.